A fascinating new book hits bookstore shelves today: Bob Dylan Revisited: 13 Graphic Interpretations of Bob Dylan's Songs. It presents on the page what musicians, including Dylan, have long since done on the stage: reinvent the songs. 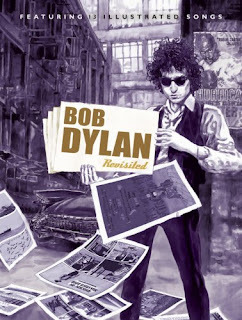 In the book—which is, according to a press release, "fully authorized by Bob Dylan and SONY Records"— thirteen graphic novelists interpret Dylan's classic tunes by creating panels of original artwork based on the lyrics. Thierry Murat's vision of "Blowin' in the Wind" is a social-realistic interpretation quite in the spirit of Dylan; Murat even alters the lyrics to craft a new refrain (something I imagine Dylan himself might admire): "all that I know, the wind whispered to me." The panels make ample use of shading in dark charcoal; when they are coupled with snatches of Dylan's sharp lyrics—"how many deaths," "how many tears," "how many wars,"—the drawings become bold and stirring, even downright haunting. There's an echo of this haunting spirit in Lorenzo Mattotti's mindtrip of "A Hard Rain's A-Gonna Fall," perhaps the most powerful interpretation in this collection. It's a colorful rendition: Edvard Munch meets Blue Man in a dark nightmare of our times. Unlike Murat, Mattotti sticks to Dylan's lyrics completely—and does so to great effect. This is a song where words come alive: "I saw ten thousand talkers whose tongues were all broken" is accompanied by the image of a blindfolded man whose tongue is sheared in half by a bodyless hand (Here, it's impossible not to recall the line in Dylan's "Political World" from Oh, Mercy: "We're livin' in a time/ a man commits a crime/ the crime don't have a face.") In another panel, the horrendous "heard one person starve, I heard many people laughin'" depicts a faceless individual begging for food while two suited men enjoy a hearty laugh, unseeing the suffering. There's absolutely no safe place in this song—even the one bright space of "I met a young girl, she gave me a rainbow" is weighted down by what's wrapped so bleakly around it—and Mattotti uses the hard, brutal lyrics as a springboard to the rawest images. In doing so he creates a visual sense of menace. The colors reflect the mood. The shortest interpretation is Jean Claude-Gőtting's "Lay Lady Lay," a starkly-imagined charcoal set of panels that, removed from the lyrics, would seem to be paintings of Depression-era America. It's a simple translation of the song: a hard-working man returns home to his loving wife. In Claude-Gőtting's hand it is a deeply moving portrait of a relationship, with zero trace of the Hallmark silliness—probably thanks to the duskiness of the panels—that could be associated with this kind of interpretation. The interpretation may be short, but it perfectly gets at what makes this book—and Dylan—so special: a deep and lasting, real and recognizable sense of humanity. Dylan's view of humanity may be dark—it may have, to quote a phrase, "gone down the drain"—but he knows what real people go through every day, and this knowledge of people is embedded into the core of all that he produces artistically. And in this book the interpreters of his songs, no matter where they take them, understand this—from the surrealistic visions of "Desolation Row" and "Tombstone Blues" to the in-your-face realness of "Hurricane" and "Blind Willie McTell." You cannot listen to Dylan's music, or read this book, without seeing that above all these songs touch on what it means to be human. There's an urgent, though subtle call for empathy in Dylan's lyrics; and the visual images in Bob Dylan Revisited: 13 Graphic Interpretations of Bob Dylan's Songs make you feel exactly what that wonderful scratchy sung voice of Dylan's makes you feel: The world may be dark, but you are not alone. Bob Dylan is one of the most significant American artists of our time. And his iconic songs will remain long after everyone reading this post today—Monday, November 16, 2009—is gone. Bob Dylan Revisited: 13 Graphic Interpretations of Bob Dylan's Songs is a brilliant picture book for grown-ups with grown-up concerns, hopes, and fears. The images pull you in, the lyrics knock you out. You can read the book in one sitting, maybe on one Metro ride to work, and the effort will be rewarded. You can open up to any song at any time of day. You can skip around at your leisure. You can read it however you want. But one thing you can't do, I assure you, is forget this book. Kyle Semmel is the publications and communications manager of The Writer's Center. Follow his tweets at http://twitter.com/writerscenter.